When designing your Tiny House, choosing the right toilet for your tiny house before you start construction will save money and headaches (well… headaches for sure). There is nothing worse than finding out later that a particular toilet will not work in your home, or causes other issues, in particular, odors! As a contractor and carpenter, I know first hand how much work is involved when changes have to be made after construction has completed – or at least proceeded past the stage you wish to change. It can be costly and typically involves a lot of work. Choosing the right toilet prior to your interior design and layout will help avoid costly, time consuming changes. In typical house construction your options for toilets are pretty standard and in most case have to conform to local and national building codes. 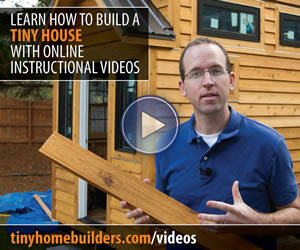 This is usually not the case when it comes to tiny houses (except those built on permanent foundations), they can be built in a number of ways depending on how you plan to use your tiny house and how frequently it will be moved – how you design the plumbing system and toilet is important. That is not to say, standards for tiny houses are not forthcoming, they are, and standards for construction are in development. Some companies building tiny houses like the Tumbleweed Tiny House Company build to strict RV Standards to ensure buyers can insure their tiny house and transport them without issues. Let’s face it, in a tiny house if you choose a poorly designed or defective toilet, there is little space to escape from foul odors permeating throughout your home. Hopefully, with good research you can choose the toilet and system that will best suit your needs. All of the above items and the ones you choose will have an impact on the design and space usage in your tiny house as well as the initial cost to build, and additional costs that you may incur in the future. But, for this article, I will focus on toilets. IMPORTANT: I highly recommend reading reviews on all the toilets listed below, in particular the lowest rated reviews, as these will bring to your attention potential issues and defects in a particular toilet or type of toilet. Amazon.com typically has the largest number of reviews on a large variety of these products and I will include links to a selection for each toilet were possible. These appear to be one of the most popular choices for tiny houses, in particular, for those who intend to move their tiny house on a regular basis. 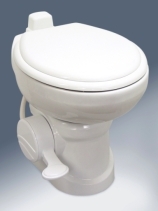 With the popularity of composting toilets, comes a greater selection and more manufacturers. 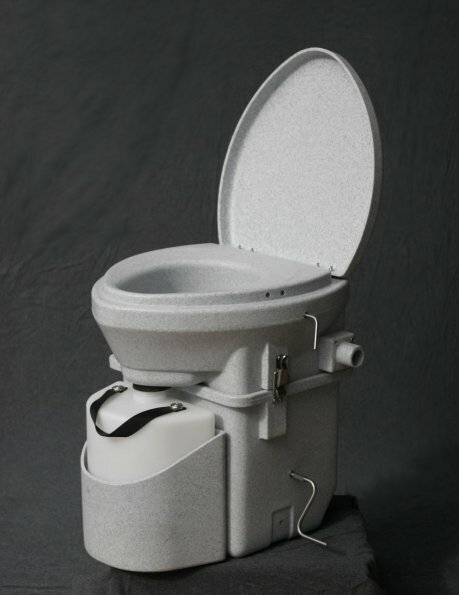 Composting toilets are not cheap and they require ongoing maintenance and additives. In addition, you have to dispose of the waste on a regular basis. If a hands on approach to dealing with human waste makes you want to heave, composted or not, these may not be for you – although it is important to note you are not hauling away raw sewage, waste from a composting toilet resembles compost, not sewage – hence the name. When it comes to designing your tiny house to accommodate a composting toilet, the primary consideration is venting and power for a fan, each toilet will have to be researched to determine exactly what is required. You will also need to make sure your toilet is located correctly to allow for easy maintenance and access as required – not all models and brands are built alike so be sure to check. 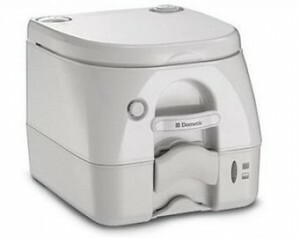 Using a composting toilet is not all that much different than a regular toilet. You sit, do your thing, and place toilet paper in the toilet as you would with a regular toilet. The big difference is for men who prefer to stand while urinating (which is most of us), it is not recommended with a composting toilet as urine is directed to the front of the bowl and collected in a separate container. 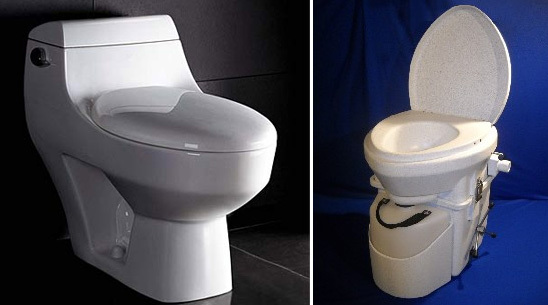 This difference may not appeal to many men, but it is highly recommended when using a composting toilet. For a full overview on composting toilets, check out the video below. This is the typical toilet found in most homes, and in most cases the cheapest to purchase and install. They are ideal for a tiny house on a permanent foundation or any tiny house that will be located on a property for the long term. These would be used if you have a septic system, large sewage holding tank or lagoon setup on your property and a water supply to provide water for flushing the toilet. Unlike many other types of toilets, these are easy to install, rough in plumbing is straight forward and you can seek out professional advice from any plumber. Parts are standardized and can be obtained at any plumbing or building store – the same would apply to replacement parts in the future. In addition, there is little to no maintenance once the toilet is operational. No additives or chemicals either – or disposal of waste on a regular basis. The only thing you would have to do is have your sewage tank pumped once or twice a year (if you use one over a septic system or lagoon). As with all other types of toilets, do your research and check as many reviews on these toilets before committing to a brand or model. In regards to flush toilets, expensive does not always translate into better performance. I personally had to swap out over 110 high end (over $400 a unit), low volume toilets in a facility due to poor flushing of solids. 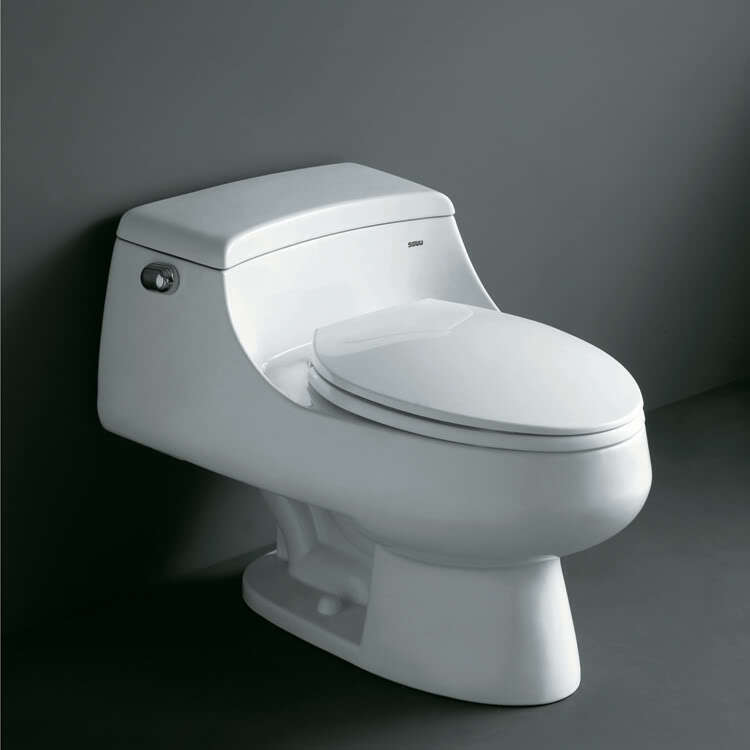 Pay close attention to performance and durability when reading reviews before choosing a flush type toilet. RV Toilets are a common choice for tiny house builders and designers. They are reasonably priced and the toilets themselves are typically small in size compared to other toilet options. The downside to these toilets is fact that you need a holding tank, water supply and chemicals for the holding tank. In addition, you need to empty the holding tank on regular basis and this means finding a proper disposal facility (RV Park or ?). The upside is that these toilets are fairly cheap compared to composting toilets. Holding tank prices will vary depending on size and quality. This is fine if you plan to park your tiny house in a RV park or similar community, but if you are planning on parking your tiny house on a property this could become a very tedious process every time the holding tank needs to be emptied and you have to tow your tiny house to a disposal station. In regards to construction and design of your tiny house, knowing if you will use this type of toilet is important as you will need to find a location to build in a holding tank, install a water supply line and so on. This is one of the least expensive options for a toilet in a tiny house. However it also will require the most amount of work. You will have to use chemicals just like a holding tank noted above, and you will have to empty the tank on these units more frequently. That said, if you are not planning to park your tiny house at a location with RV hookups and sewage disposal station (or park), this might be better than a built-in RV toilet. If you have a built-in unit and are not located in a park with hookups, you will have to drive your tiny house to a location with sewage disposal available. With a portable RV toilet, you only need to put the unit in the back of your pick or SUV and bring it to a disposal station. Overall, and realistically, portable RV toilets are good for a short term solution. In the long run I would think most people will get fed up with the constant disposal of sewage and the maintenance/cleaning that goes with it. That said, if you think this is a possible solution, for the interm or long term, be sure to check lots of reviews on Amazon and elsewhere as these units seem to have similar problems as fixed RV toilets noted above. If I had to choose a solution, my initial choice would be a composting toilet. However, there are a few modifications I would make to my tiny house with future changes in mind. After all, even if you spend a few years traveling around in your tiny house, eventually you will probably want to settle in on a property somewhere. I personally would like a regular flush toilet at that time and I would design my tiny house now to make that change easier later on. In the design/construction process I would install a removable panel in the area below the toilet, large enough to install a standard drain assembly in the future. In this way, I can remove the composting toilet and install a regular flush toilet with ease. I would also install a cold water supply line to the back of the toilet area and cap it off – if I ever need it I won’t have to worry about how to get a water supply into this area of my tiny house. 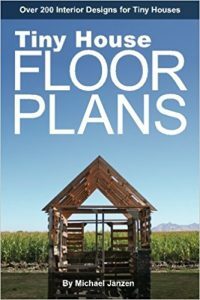 All that said, one never knows what they get used to and I may like a composting toilet… and opt not to install a standard flush toilet and septic system – either way, I think it is wise to design and build leaving yourself some options for future changes. The Cubic Mini Wood Stoves for Tiny Houses are Here!